Emeritus Professor A. D. Hope retired in 1968 but remained an active member of the university community. 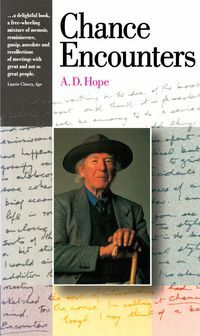 A foundation member of the Australian Academy of the Humanities and an honorary member of the American Academy and Institute of Arts and Letters since 1989, he accepted an OBE in 1972 and an AC in 1981. His many books include Collected Poems 1930-1965, Dunciad Minor, A Late Picking, The Age of Reason, Orpheus, A Midsummer Eve's Dream and a play, Ladies from the Sea.